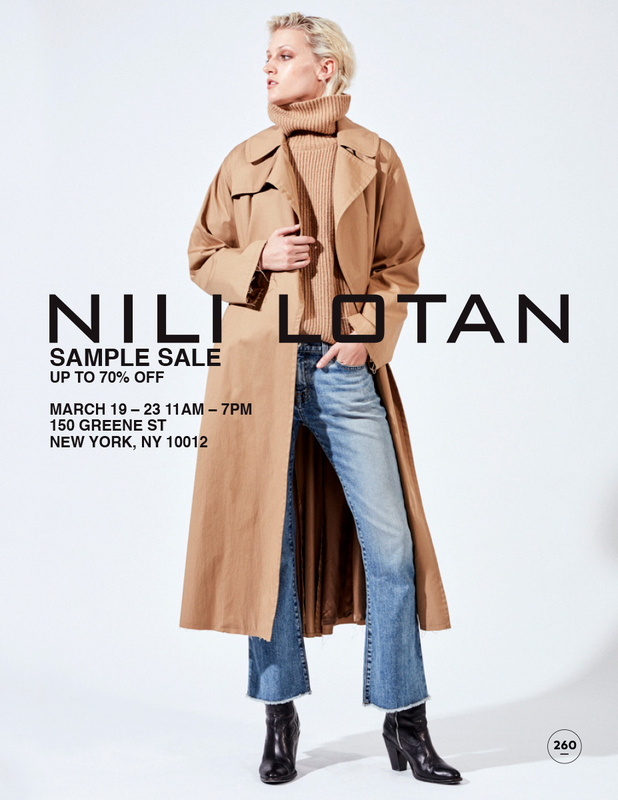 260 Sample Sale is excited to welcome the Nili Lotan Sample Sale to our 150 Greene Street location in Soho. Join us Tuesday, March 19th through Saturday, March 23rd to shop women's apparel and accessories - at up to 70% off retail! "Nili Lotan is a critically acclaimed and renown Israeli-born and New York-based ready-to-wear fashion designer. After graduating from the prestigious Shenkar College of Engineering and Design in Tel Aviv, Israel, Nili moved to NYC in 1980 to pursue a career in fashion design. Since, Nili has enjoyed a very successful career, having lead design teams at America's leading fashion houses, including Ralph Lauren, Liz Claiborne, and Nautica. In 2003 Nili launched her own namesake label, designing a wardrobe of luxurious, chic, and timeless pieces for today's woman. Nili's collections have been equally well received by the market and editors alike. Her pieces are regularly featured in top fashion and lifestyle publications like VOGUE, Harper's Bazaar, WSJ. Over the years, Nili's designs have accrued a glittering list of dedicated followers including Gigi Hadid, Kendall Jenner, Christy Turlington, Jennifer Lawrence, Gwyneth Paltrow, Julianne Moore, and Karolina Kurkova, among many more."